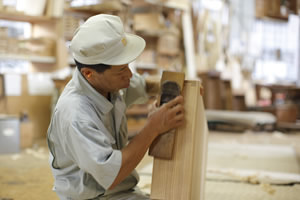 About the Manufacturing Process｜Matsuso's Furniture｜Matsuso Co.,Ltd. 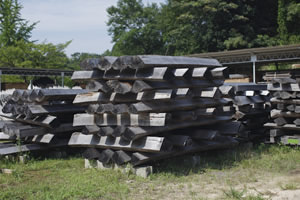 The paulownia is dried as logs, then ground, sawn and dried again.The various characteristics of the trees are detected and they are made into boards depending on how they will be used. Paulownia is actually a living thing and must be dried naturally. Having been washed clean over and over again in the rains of the rainy season, it takes an astoundingly long time to dry.We use various drying methods depending on the intended use of the wood. Only the high quality areas are selected and used from a single log. This is particularly true of the surface materials, where only a small amount of high quality edge grain is carefully selected and used from each log. Materials are scrutinized, sawn, and sufficient time is spent cleaning and drying resulting in a beautiful, non-warped product. Paulownia logs come in various sizes and, because the cut boards are also not uniform, they are bucked to match the dressers. 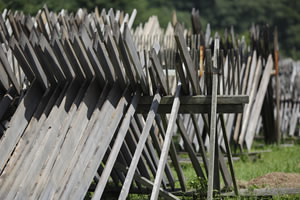 Narrow boards are then grafted and tree quality is selected. Finally, warped and damaged areas are cut short and a single beautiful board is made using the appropriate areas. 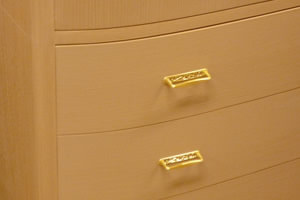 Here each component is assembled for the first time and the familiar shape of a dresser can be seen. 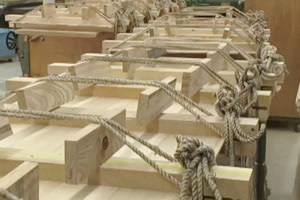 In trades that require years of experience and past successes, such as board milling on various "planes" and the making of "coaks", we use only wooden nails made from the "deutzia tree" with absolutely no metal parts used internally during the assembly process.It is a strenuous process where everything is done with no room for even the smallest deviation.